Keirl hairdressing opened it’s doors in May 2014. Consisting of 4 independent hairstylists all with a wealth of experience, passion for hairdressing and each with 11 year’s experience behind them and very loyal clienteles. 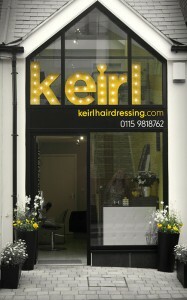 In 2011 1b exchange road, West Bridgford was converted from an old garage into a stylish 2 storey shop unit, of which Nottingham based hairdresser Emma Gordon with 11 years hairdressing experience behind her and an extremely loyal clientele decided to set up KEIRL hairdressing in name of her late Grandma, Connie KEIRL.